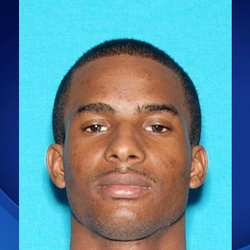 23-year-old Allen Matthew Baker III, of San Diego was shot and killed by a Sunnyvale public safety officer on Saturday August 15, 2015. Another suspect is in custody and a third who got away has an outstanding arrest warrant in connection with a homicide. Around 4:15 p.m. someone reported suspicious activity at a Motel 6, including two women going back and forth between a Jaguar and a motel room. When officers approached the vehicle they say two of the three men inside took off running. According to Hunter, one dropped a high capacity magazine and then pointed a gun at the officer. "The officer fired nine rounds at the suspect," he said. "The officer and the suspect were facing each other at the time of the shooting and in very close proximity to one another." Hunter says it's unclear whether or not Baker fired any rounds. Investigators say they found another loaded gun in his backpack.